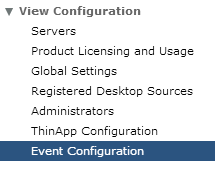 Now that the Connection Server and View Composer are installed, it’s time to configure the components to actually work together with vCenter to provision and manage desktop pools. 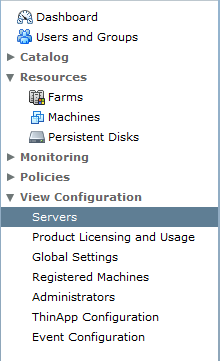 Once you’ve logged in and configured your license, you can start setting up the Horizon View environment. 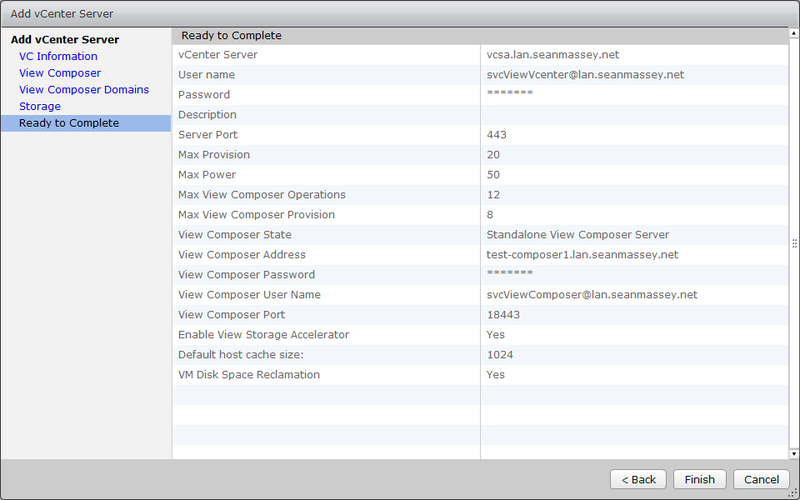 In this step, the Connection Server will be configured to talk to vCenter and View Composer. 1. Expand View Configuration and select Servers. 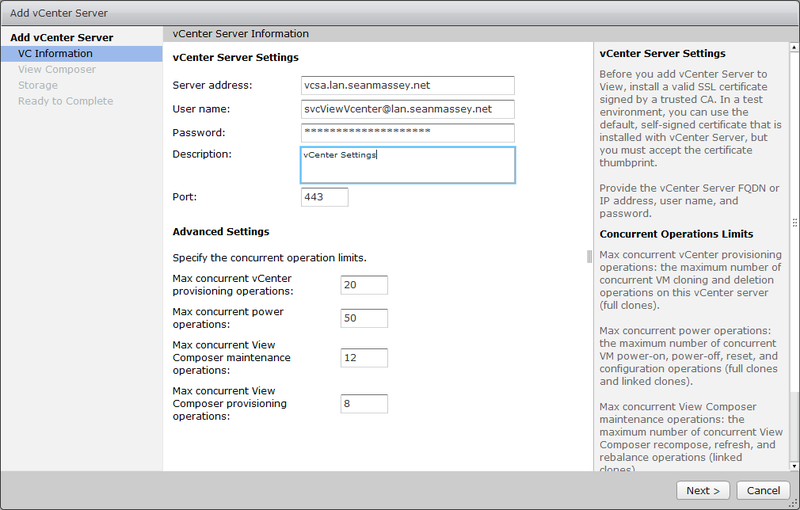 3, Enter your vCenter server information. The service account that you use in this section should be the vCenter Service Account that you created in Part 6. 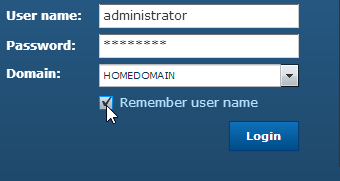 Note: If you are using vCenter 5.5 or later, the username should be entered in User Principal Name format – username@fqdn. 4. 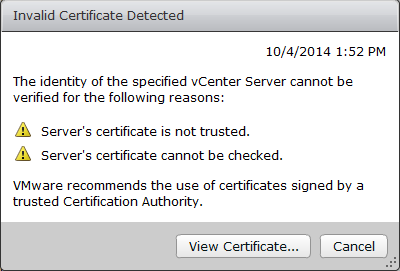 If you have not updated the certificates on your vCenter Server, you will receive an Invalid Certificate Warning. Click View Certificate to view and accept the certificate. A. 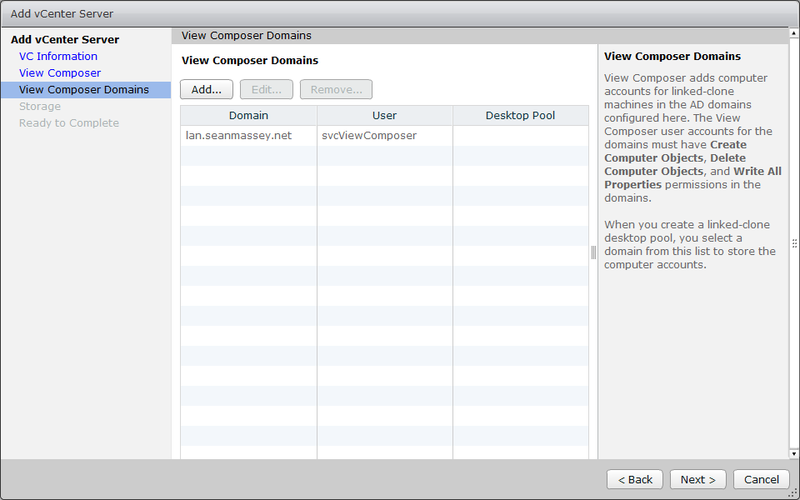 Do not use View Composer – View Composer and Linked Clones will not be available for desktop pools that use this vCenter. B. 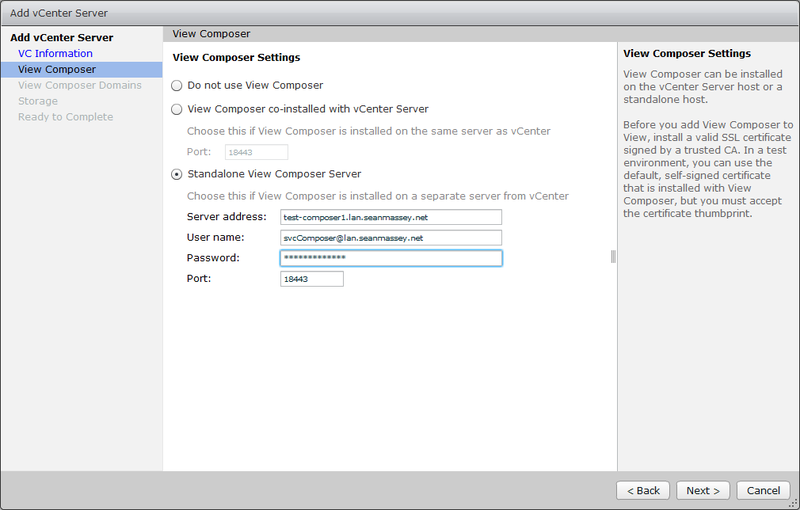 View Composer is co-installed with vCenter Server – View Composer is installed on the vCenter Server, and the vCenter Server credentials entered on the previous screen will be used for connecting. This option is only available with the Windows vCenter Server. 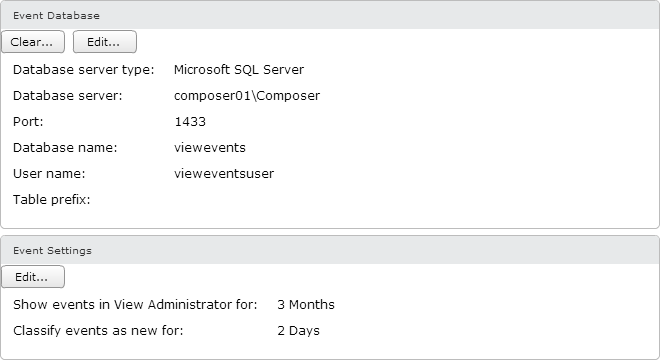 C. Standalone View Composer Server – View Composer is installed on a standalone Windows Server, and credentials will be required to connect to the Composer instance. This option will work with both the Windows vCenter Server and the vCenter Server virtual appliance. 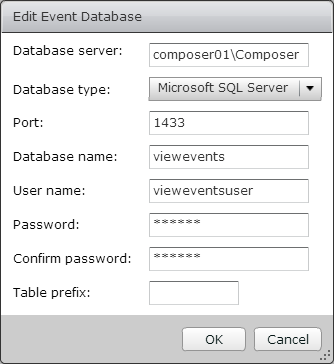 Note: The account credentials used to connect to the View Composer server must have local administrator rights on the machine where Composer is installed. If they account does not have local administrator rights, you will get an error that you cannot connect. 6. If Composer is using an untrusted SSL certificate, you will receive a prompt that the certificate is invalid. Click View Certificate and then accept. 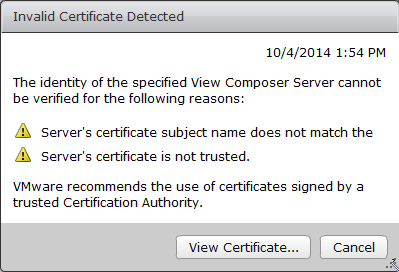 For more information on installing a trusted certificate on your Composer server, please see Part 5. 7. The next step is to set up the Active Directory domains that Composer will connect to when provisioning desktops. Click Add to add a new domain. 8. Enter the domain name, user account with rights to Active Directory, and the password and click OK. The user account used for this step should be the account that was set up in Part 6. Once all the domains have been added, click Next to continue. 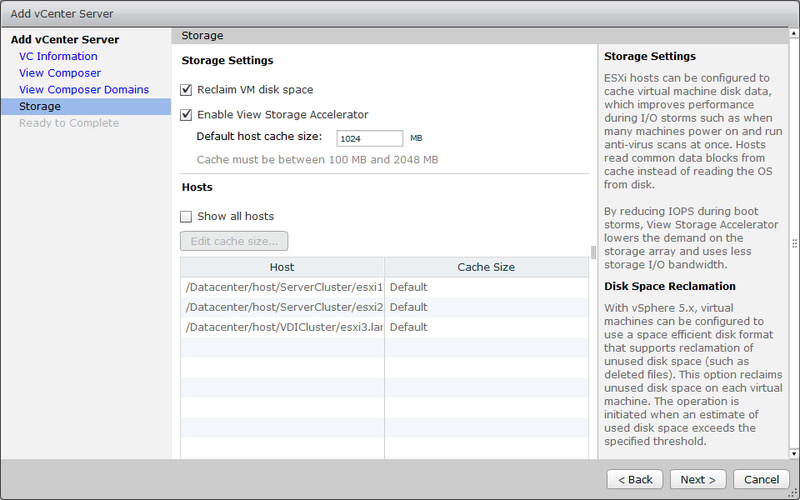 Reclaim VM Disk Space – Allows Horizon to reclaim disk space allocated to linked-clone virtual machines. Enable View Storage Accelerator – View Storage Accelerator is a RAMDISK cache that can be used to offload some storage requests to the local system. Regenerating the cache can impact IO operations on the storage array, and maintenance blackout windows can be configured to avoid a long train of witnesses. The max cache size is 2GB. After you have made your selections, click Next to continue. Part 6 described the steps for creating the database and the database user account. SQL Server is one of those applications where performance can be greatly impacted by the initial server configuration. One of the big contributing factors to this is storage configuration. If this isn’t optimized at the VM or the storage array level, performance will suffer, and an entire book has been dedicated to the subject. SQL Server may seem ubiquitous in many environments because many applications require a SQL database for storing data. And in many cases, a new application means deploying a new database server. Because SQL can require a virtual machine setup that follows a different baseline, each new SQL Server will either need to be deployed from a custom template for SQL or hand-crafted from whatever base template it was deployed from. If you want to keep your template count to a minimum but still avoid having to hand craft your SQL Servers, we need to turn to PowerCLI and PowerShell 4.0. Windows Server 2012 R2 and PowerShell 4.0 introduced a number of new Cmdlets that will assist in preparing a brand new VM to run SQL Server. These cmdlets handle storage and disk operations, and these new cmdlets will be instrumental in provisioning the additional storage resources that the server needs. The code for this script is up on Github. When you virtualize SQL Server, there are a few best practices that should be done to ensure good performance. Therefore, we want to ensure that the script to prepare the server for SQL implements these best practices. Most of these best practices relate to storage configuration and disk layout. One of the other goals of this process is to ensure consistency. All SQL Servers should be configured similarly, and drive letters, use of mount points, and installation paths should be the same on all SQL Servers to ease administrative overhead. 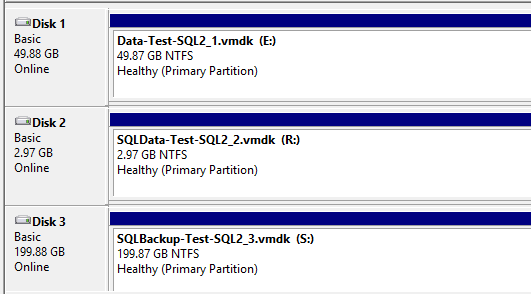 I have a couple of preferences when deploying SQL in my environment. Each instance will have two dedicated volumes – one for SQL data files and one for SQL logs. I prefer to use mount points to store the data and log files for my databases and TempDB. This allows me to keep drive letter assignments consistent across all database servers, and if I need to add an instance to a server, I don’t need to find free drive letters for the additional disks. I also like to include the VMDK file name in the volume label. Drive numbers can change on VMs as drives are added and removed, so adding the VMDK file name to the volume label adds an additional value to check if you need to expand a disk or remove one from production. Finally, I like to install SQL Server Management Studio prior to installing the database engine. This gives me one less feature to worry about when configuring my instance deployments. Change the Storage Policy to automatically set all newly attached disks to Online so they can be configured. Create the following volumes as mount points, and attach them to PVSCSI storage controllers. The script doesn’t add or configure any disks that will be used for the actual SQL Server instances that will be installed on the server. I have another script that handles that. In the past, the only ways to manage disks using PowerShell were using the old command line utilities like fdisk or to use WMI. That changed with Windows Server 2012 R2, and new disk management commands were included with PowerShell 4.0. Note: These commands only work against Windows Server 2012 R2 and newer. 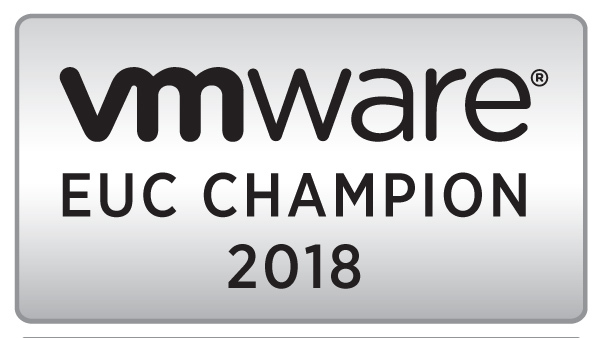 These commands will take care of all of the disk provisioning tasks once the VMDK has been added to the server, including initializing the disk, creating the partition, and formatting it with the correct block size. The PowerShell commands also allow us to define whether the disk will be a mount point or be accessed through a drive letter. Note: When attaching a disk as a mount point, there are some additional options that need to be selected to ensure that it does not get a drive letter assigned after a reboot. Please see the code snippet below. One of the neat things about these new cmdlets is that they use the new CIMSession connection type for PowerShell remoting. Cmdlets that use CIMSessions are run on the local computer and connect to a WMI instance on the remote machine. Unlike PSSessions, network connections are only utilized when a command is being executed. An example of these cmdlets in action is the function to mount a VMDK as a mount point. $VolumeSizeGB = [string]$VolumeSize + "GB"
This function handles configuring a new disk for SQL, including formatting it with a 64KB block size, and attaches it as an NTFS mount point. If you read through the code, you’ll notice that the disk is configured to not assign a drive letter in multiple places. While writing and testing this function, all mount points would gain a drive letter when the system was rebooted. In order to prevent this from happening, the script needed to tell Windows not to assign a drive letter multiple times. One thing that this particular script does not do is create the data and log volumes for a SQL instance. While it wouldn’t be too hard to add that code in and prompt for an instance name, I decided to place that logic in another script. This allows me to manage and use one script for adding instance disks instead of having that logic in two places. This also helps keep both scripts smaller and more manageable. The last step in this process is to install SQL Server. Unfortunately, that step still needs to be done by hand at this point. The reason is that the SQL installation requires Kerberos in order work properly, and it throws an error if I try to install using WinRM. On October 15th, I will be presenting at the Northeast Wisconsin chapter of the Association of Information Technology Professionals. The title of my presentation is “The Passion of the Geek: How to Build A Home Lab to Take Your Skills to the Next Level.” The session will cover different techniques for building a home lab. You can get more information and sign up for the meeting at the Northeast Wisconsin AITP website.